"RCAF" redirects here. For other uses, see RCAF (disambiguation). "Canadian Air Force" redirects here. For the Canadian air force established in 1918, see Canadian Air Force (1918–1920). For the air force established in 1920, see Canadian Air Force (1920–1924). The Royal Canadian Air Force (RCAF; French: Aviation royale canadienne, ARC) is the air force of Canada. Its role is to "provide the Canadian Forces with relevant, responsive and effective airpower". The RCAF is one of three environmental commands within the unified Canadian Armed Forces. As of 2013, the Royal Canadian Air Force consists of 14,500 Regular Force and 2,600 Primary Reserve personnel, supported by 2,500 civilians, and operates 258 manned aircraft and 9 unmanned aerial vehicles. Lieutenant-General Al Meinzinger is the current Commander of the Royal Canadian Air Force and Chief of the Air Force Staff. The Royal Canadian Air Force is responsible for all aircraft operations of the Canadian Forces, enforcing the security of Canada's airspace and providing aircraft to support the missions of the Royal Canadian Navy and the Canadian Army. The RCAF is a partner with the United States Air Force in protecting continental airspace under the North American Aerospace Defense Command (NORAD). The RCAF also provides all primary air resources to and is responsible for the National Search and Rescue Program. The RCAF traces its history to the Canadian Air Force, which was formed in 1920. The Canadian Air Force was granted royal sanction in 1924 by King George V to form the Royal Canadian Air Force. In 1968, the RCAF was amalgamated with the Royal Canadian Navy and the Canadian Army, as part of the unification of the Canadian Forces. Air units were split between several different commands: Air Defence Command (interceptors), Air Transport Command (airlift, search and rescue), Mobile Command (tactical fighters, helicopters), Maritime Command (anti-submarine warfare, maritime patrol), as well as Training Command. In 1975, some commands were dissolved (ADC, ATC, TC), and all air units were placed under a new environmental command called simply Air Command (AIRCOM). Air Command reverted to its historic name of "Royal Canadian Air Force" in August 2011. The Royal Canadian Air Force has served in the Second World War, the Korean War, the Persian Gulf War, as well as several United Nations peacekeeping missions and NATO operations. As a NATO member, the force maintained a presence in Europe during the second half of the 20th century. The Canadian Air Force (CAF) was established in 1920 as the successor to a short-lived two-squadron Canadian Air Force that was formed during the First World War in Europe. John Scott Williams, MC, AFC, was tasked in 1921 with organizing the CAF, handing command over later the same year to Air Marshal Lindsay Gordon. The new Canadian Air Force was a branch of the Air Board and was chiefly a training militia that provided refresher training to veteran pilots. Many CAF members also worked with the Air Board's Civil Operations Branch on operations that included forestry, surveying and anti-smuggling patrols. In 1923, the CAF became responsible for all flying operations in Canada, including civil aviation. In 1924, the Canadian Air Force, was granted the royal title, becoming the Royal Canadian Air Force (RCAF). Most of its work was civil in nature; however, in the late 1920s the RCAF evolved into more of a military organization. After budget cuts in the early 1930s, the air force began to rebuild. Two armourers of No 440 Squadron RCAF re-arming a Hawker Typhoon in the Netherlands, 1944. During the Second World War, the RCAF was a major contributor to the British Commonwealth Air Training Plan and was involved in operations in Great Britain, Europe, the north Atlantic, North Africa, southern Asia, and with home defence. By the end of the war, the RCAF had become the fourth largest allied air force. During WWII the Royal Canadian Air Force were headquartered in 20-23 Lincolns Inn Fields, London. A commemorative plaque can be found on the outside of the building. After the war, the RCAF reduced its strength. Because of the rising Soviet threat to the security of Europe, Canada joined NATO in 1949, and the RCAF established No. 1 Air Division RCAF consisting of four wings with three fighter squadrons each, based in France and West Germany. In 1950, the RCAF became involved with the transport of troops and supplies to the Korean War; however, it did not provide RCAF combat units. Members of the RCAF served in USAF units as exchange officers and several flew in combat. 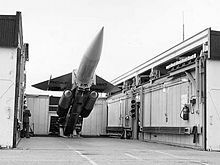 Both auxiliary and regular air defence squadrons were run by Air Defence Command. At the same time, the Pinetree Line, the Mid-Canada Line and the DEW Line radar stations, largely operated by the RCAF, were built across Canada because of the growing Soviet nuclear threat. In 1957, Canada and the United States created the joint North American Air Defense Command (NORAD). Coastal defence and peacekeeping also became priorities during the 1950s and 1960s. In 1968, the Royal Canadian Navy, Royal Canadian Air Force and Canadian Army were amalgamated to form the unified Canadian Forces. This initiative was overseen by then Liberal Defence Minister, Paul Hellyer. The controversial merger maintained several existing organizations and created some new ones: In Europe, No. 1 Air Division, operated Canadair CF-104 Starfighter nuclear strike/attack and reconnaissance under NATO's 4 ATAF; Air Defence Command: operated McDonnell CF-101 Voodoo interceptors, CIM-10 Bomarc missiles and the SAGE radar system within NORAD; Air Transport Command: provided strategic airlift for the NATO and UN Peacekeeping missions; and Training Command. Aviation assets of the Royal Canadian Navy were combined with the RCAF Canadair CP-107 Argus long-range patrol aircraft under Maritime Command. In 1975, the different commands, and the scattered aviation assets, were consolidated under Air Command (AIRCOM). An RCAF CIM-10 Bomarc missile on a launch erecter in North Bay. Viewed as an alternative to the scrapped Avro Arrow, the Bomarc's adoption was controversial given its nuclear payload. In the early 1990s, Canada provided a detachment of CF-18 Hornets for the air defence mission in Operation Desert Shield. The force performed combat air patrols over operations in Kuwait and Iraq, undertook a number of air-to-ground bombing missions, and, on one occasion, attacked an Iraqi patrol boat in the Persian Gulf. In the late 1990s, Air Command's CF-18 Hornets took part in the Operation Allied Force in Yugoslavia, and in the 2000s, AIRCOM was heavily involved in the Afghanistan War, transporting troops and assets to Kandahar. Later in the decade-long war, AIRCOM set up a purpose-specific air wing, Joint Task Force Afghanistan Air Wing, equipped with several CH-146 Griffon and CH-147 Chinook helicopters, CC-130 Hercules, CU-161 Sperwer and leased CU-170 Heron UAVs in support of the Canadian Forces and ISAF mission. The wing stood down on 18 August 2011. From 18 March to 1 November 2011, the RCAF was engaged in Operation Mobile, Canada's contribution to Operation Unified Protector in Libya. Seven CF-18 Hornet fighter aircraft and several other aircraft served under Task Force Libeccio as part of the military intervention. An RCAF CF-18 Hornet during Operation Impact, 2015. CF-18s have been used by the RCAF since 1983. On 16 August 2011, the Government of Canada announced that the name "Air Command" was being changed to the air force's original historic name: Royal Canadian Air Force (along with the change of name of Maritime Command to Royal Canadian Navy and Land Force Command to Canadian Army). The change was made to better reflect Canada's military heritage and align Canada with other key Commonwealth countries whose military units use the royal designation. The RCAF adopted a new badge in 2013, which is similar to the pre-unification RCAF badge (although placed in the modern frame used for command badges). The Latin motto of Air Command – Sic itur ad astra – which was the motto of the Canadian Air Force when first formed after the First World War (before it became the Royal Canadian Air Force in 1924) was retained. Though traditional insignia for the RCAF was restored in 2015, there has been no restoration of the traditional uniforms or rank structure of the historical service (apart from a rank of "Aviator", which replaced that of "Private" in 2015). 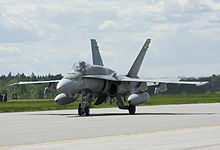 On 17 April 2014, Prime Minister Stephen Harper announced that Canada was dispatching six CF-18s and military personnel to assist NATO in operations in Eastern Europe. The Royal Canadian Air Force has about 391 aircraft in service, making it the sixth-largest air force in the Americas, after the United States Air Force, United States Navy, United States Army, United States Marine Corps, and Brazilian Air Force. An RCAF CC-150 Polaris refueling two CF-18 Hornets near CFB Borden. Second-hand Airbus A310 transports purchased in 1992 for use as strategic transports and air-to-air tankers to replace the Boeing CC-137. Two have been converted to tankers and are designated the CC-150T. One is permanently configured for VIP transport; five aircraft are operated by 437 Squadron based at 8 Wing Trenton, Ontario. Single-engined lead-in fighter trainer leased in 2000. 16 aircraft in service, based at 15 Wing Moose Jaw, SK and 4 Wing Cold Lake, Alberta. Multi-engine training aircraft. Leased to RCAF by Allied Wings, 7 aircraft are based at Portage la Prairie, MB. An RCAF C-17 Globemaster III at Calgary International Airport. Five strategic airlifters operated by 429 (T) Squadron based at 8 Wing Trenton, Ontario. Four were delivered from 2007 to 2008, a fifth was delivered in 2015. Utility and VIP transport aircraft first delivered in 1982. Early Challenger 600 and 601 models were supplemented by 604 models in 2002. Four aircraft are operated by 412(T) Sqn and based in Ottawa, but belong to 8 Wing Trenton. Entered service in 1962 as a basic and advanced jet trainer with 190 originally ordered, replaced by the CT-156 Harvard II and CT-155 Hawk in 2000. A total of 27 aircraft remain in service, 24 of which are used by 431 Air Demonstration Squadron, "The Snowbirds". A Twin-engined utility/cargo transport now used for search and rescue. Six are operated by 442 Transport and Rescue Sqn. at 19 Wing Comox, BC. A twin-engined utility transport operated since the 1970s, four remain based at Yellowknife, NT, operated by 440 Transport Squadron. Single engine primary trainer used to train pilot candidates before they move onto the Harvard II. Leased to RCAF by Allied Wings, 14 aircraft are based at Portage la Prairie, MB. An RCAF CC-130H Hercules on approach to Winnipeg James Richardson International Airport. Four-engined tactical transport. Several versions have been operated since 1960. Remaining CC-130Hs used for search and rescue and air-to-air refuelling. 8 aircraft remain in service, five of which have been converted to air-to-air tankers. Based at 14 Wing Greenwood, NS, 8 Wing Trenton, ON and 17 Wing, Winnipeg, MB. Four-engined maritime patrol aircraft based on the American Lockheed P-3 Orion; entered service in 1980, 18 aircraft now based at 19 Wing Comox, BC and 14 Wing Greenwood, NS. Four-engined tactical airlifter replacing earlier Hercules variants in that role. A total of 17 are in service operated by 436 (T) Squadron based at 8 Wing Trenton. An RCAF CF-18 Hornet during the Bagotville Air Show. Fighter entered service in 1982 when 98 single-seat CF-18As and 40 two-seat CF-18Bs were ordered. Seventeen have been lost since 1984. Stationed at 3 Wing Bagotville, Quebec and 4 Wing Cold Lake, Alberta; 60 CF-18As and 25 CF-18Bs remain in active service. Single-engined utility and training helicopter. Ordered for 3 Canadian Forces Flying Training School at CFB Portage la Prairie, MB; used by Regular Forces in CFB Lahr in Germany and in Canada during the 1980s; replaced by CH-146 Griffons. 12 aircraft remain, leased from Allied Wings, used for flight training in Portage la Prairie, MB. An RCAF CH-146 Griffon provides close air support for units of the Afghan Armed Forces, and ISAF. A utility transport tactical helicopter (UTTH) that entered service between 1995 and 1997. Original purchase of 100 aircraft to replace the CH-136 Kiowa (Bell 206), CH-135 Twin Huey (Bell 212), CH-118 Iroquois (Bell 205), and Boeing C-Model Chinooks CH-47C. Based at Bagotville, Quebec (439 Squadron), St. Hubert, Quebec (438 Squadron), Cold Lake, Alberta (417 Squadron), Gagetown, New Brunswick (403 Squadron), Valcartier, Quebec (430 Squadron), Goose Bay, Newfoundland (444 Squadron), Edmonton, Alberta (408 Squadron), and Borden, Ontario (400 Squadron); also perform search and rescue duties at 8 Wing Trenton (424 Squadron). Deployed to Afghanistan to provide escorts for the Chinooks, armed with a combination of 7.62mm C-6 machine gun, 7.62mm Dillon Aero M134D Gatling gun, and GAU-21 .50 caliber machine gun on one or both doors. 9 ex-RCAF Griffons, designated CT-146, are leased from Allied Wings for pilot training at Portage la Prairie, MB. Triple-engined search and rescue helicopter that replaced the CH-113 Labrador. Fourteen delivered between 2000 and 2002. Based at (103 Squadron) 9 Wing Gander, Newfoundland, (413 Squadron) 14 Wing Greenwood, Nova Scotia and (442 Squadron) 19 Wing Comox, British Columbia. One aircraft has been lost in a training accident. The CH-148 Cyclone is a ship-based helicopter operated by the RCAF. Ship-based transport/anti-submarine helicopter based on the Sikorsky H-92 Superhawk. Twenty-eight ordered to replace the Sea King from 2009. Delays pushed the delivery date to 2015 when six were delivered. Three aircraft in service as of 2017. The CH-147F Chinook is an advanced, multi-mission, medium to heavy-lift helicopter. Its primary mission is the tactical transport of equipment and personnel during domestic or deployed operations. 450 Tactical Helicopter Squadron, under the command of 1 Wing Kingston, Ont., and based in CFB Petawawa, Ont., was re-established as the home of Canadaʼs fleet of 15 CH-147F Chinooks. The first two airframes underwent intensive operational test and evaluation in the United States for several months before Canada received the first airframe 147303 at an official acceptance ceremony at the Ottawa International Airport on 27 June 2013. 15 aircraft are in service as of 2017. The Canadian Forces have leased aircraft from vendors to help transport troops and equipment from Canada and other locations in the past decade. Transport aircraft have been leased as required. Two aircraft leased from Transwest Air Limited. Used by the Multi-Engine Utility Flight (MEUF) in CFB Trenton. Flown by RCAF pilots, they are used for light transport of personnel and equipment within North America. Weapons systems are used by the CF-18 Hornet, CP-140 Aurora, CH-146 Griffon and the CH-124 Sea King helicopters (the latter to be replaced by CH-148 Cyclone). The Commander of the Royal Canadian Air Force, located at National Defence Headquarters in Ottawa, commands and provides strategic direction to the Air Force. The commander of 1 Canadian Air Division and Canadian NORAD Region, based in Winnipeg, is responsible for the operational command and control of Air Force activities throughout Canada and worldwide. 2 Canadian Air Division, established in June 2009, consists of training establishments. There are 13 wings across Canada, 11 operational and 2 used for training. Wings represent the grouping of various squadrons, both operational and support, under a single tactical commander reporting to the operational commander. Ten wings also include a Canadian Forces base along with other operational and support units. The rank of general is held when an air officer is serving as Chief of the Defence Staff. The Commander of the Royal Canadian Air Force holds the rank of lieutenant-general. Divisions are commanded by major-generals. Brigadier-generals are typically second-in-command of a division. Wings are commanded by colonels. Squadrons are commanded by lieutenant-colonels. Majors are typically second-in-command of squadrons, or flight commanders. Captains, lieutenants and second lieutenants are the junior level leaders in RCAF squadrons and headquarters. Headquartered at CFB Kingston, 1 Wing provides airlift support of troops and equipment anywhere in the world. Its tactical helicopter squadrons are spread out across Canada; six operate the CH-146 Griffon helicopter and one operates the CH-147F Chinook helicopter. Located in Quebec's Saguenay region, 3 Wing provides general purpose, multi-role, combat-capable forces in support of domestic and international roles of Canada's air force. It also provides search and rescue missions. The busiest fighter base in Canada, 4 Wing provides general purpose, multi-role, combat-capable forces in support of domestic and international roles of Canada's air force. Home of fighter pilot training for the Canadian Forces, 4 Wing attracts top gun crews from all over the world to its annual air combat exercise, Maple Flag. 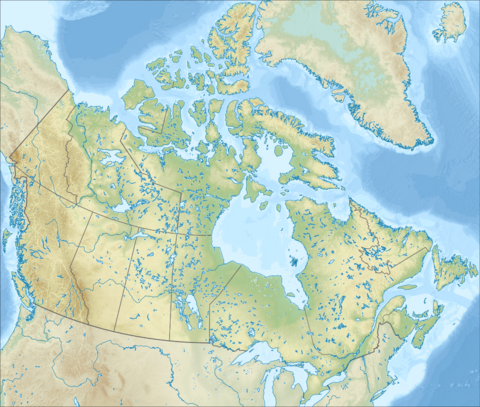 Cold Lake Air Weapons Range (CLAWR), north of the base, is the only tactical bombing range in western Canada. The one million hectare (11,600 square km) range includes the Primrose Lake Evaluation Range, 4 Wing's primary test range. The site of NATO tactical ultra-low-level flight training in Canada, 5 Wing, located in Labrador, hosts temporary detachments from several NATO nations. Goose Bay Weapons Range is the only tactical bombing range in eastern Canada. The thirteen million hectare (130,000 square km) range includes ultra-low-level flying training to 100 feet above ground level, supersonic flight areas, and an inert conventional and precision guided (laser) munitions bombing range. 5 Wing is the home of 444 Combat Support Squadron and serves as a NORAD CF-18 Hornet deployed operating base and airfield supporting a mix of aviation activities, military and civilian, in eastern Canada. 8 Wing is the heart of Canada's air mobility forces, from delivering supplies to the high Arctic (CFS Alert) to airlifting troops and equipment worldwide. It is also responsible for search and rescue in central Canada and home to the Skyhawks Parachute Team with the Canadian Army Advanced Warfare Centre. It is also the largest Air Force base in Canada. Providing search and rescue (SAR) services to eastern Canada and the western Atlantic Ocean. SAR crews at 9 Wing Gander fly the AgustaWestland CH-149 Cormorant helicopter and are responsible for a huge area, covering the lower Arctic, Labrador, Newfoundland, the Maritimes and the North Atlantic from the shores of Newfoundland to 30° west. The centre of naval aviation in Canada, 12 Wing operates CH-148 Cyclone helicopters, and supports the Royal Canadian Navy with helicopter air detachments for surface warships in the Atlantic and Pacific fleets. Located in Nova Scotia's Annapolis Valley, 14 Wing's CP-140 Aurora crews conduct sovereignty and surveillance missions over the Atlantic Ocean routinely, while SAR capabilities for the Maritimes, eastern Quebec and the eastern Arctic are provided by CH-149 Cormorant helicopters and CC-130 Hercules fixed-wing aircraft. Comprising three squadrons and six schools, 17 Wing also provides support to the Central Flying School, as well as headquarters and administration support for NORAD operations. Located on Vancouver Island, its Aurora crews provide surveillance of the Pacific Ocean and western and Arctic regions. The Buffalo and Cormorant crews are responsible for search and rescue in British Columbia, Yukon and the North Pacific Ocean. The base is also used for training fighter pilots in tactical procedures on nearby ranges. 22 Wing represents one of Canada's major contributions to the North American Aerospace Defence (NORAD) agreement. Personnel watch over Canada's airspace 24 hours a day, using state-of-the-art sensors, computer and communications equipment. 21 Aerospace Control and Warning Squadron is the unit in CADS that carries out the air sovereignty of Canada. Brigadier-General Rick Pitre assumed command of the Canadian Force’s most recent formation, the newly established 2 Canadian Air Division/Air Force Doctrine and Training Division in a formal ceremony at 17 Wing, Winnipeg on Thursday, June 25. The Air Force has embarked on what Brig. Gen. Pitre calls “a new and exciting chapter in our rich air force history.” Commander 2 Canadian Air Division is now responsible for all Air Force doctrine, individual training and education. In addition to the Canadian Aerospace Warfare Centre located at 8 Wing Trenton, Brigadier General Pitre will oversee the conduct and management of training establishments at:15 Wing Moose Jaw, 16 Wing Borden, and a new Air Force Training Centre comprising several Air Force schools and training institutions In addition, he will have oversight of training conducted by the Prairie Cadet Region. The site of the NATO Flying Training Program in Canada which is supported by 2 Canadian Forces Flying Training School (2CFFTS), 15 Wing is also home to the Snowbirds, the air force's aerobatic team. This base is the location of the largest training facility in the Canadian Forces. 16 Wing's schools provide air force technical training and professional development and is the historic birthplace of the RCAF. 400 Tactical Helicopter Squadron is a lodger unit based at Borden's airfield. The Canadian Forces School of Aerospace Technology and Engineering (CFSATE), located in Borden, Ontario, delivers Aerospace Engineering Officers and conducts apprentice level training for various trades, including Avionics, Aviation, Aircraft Structures and Imagery technicians. The role of CFSATE is to provide the Air Force with qualified personnel to ensure Aircraft serviceability. CFSATE develops and carries out individual aerospace engineering training in accordance with approved doctrine and standards. 18 Wing Edmonton: Located in Edmonton, Alberta, it was the base for 408 Tactical Helicopter Squadron, 418 "City of Edmonton" Air Reserve Squadron, 435 Transport Squadron, 440 Transport and Rescue Squadron and 447 Transport Helicopter Squadron. It closed in 1994 and transferred to Land Force Command as army base CFB Edmonton, where 408 Tactical Helicopter Squadron is the sole remaining air unit. As the tasking authority responsible for the Canadian Contracted Air Transport Unit, the wing commander provided advice, co-ordination and supervision over its six leased Mi-8 medium lift helicopters. The air wing had about 450 personnel, serving with the Theatre Support Element in the Persian Gulf region and the Tactical UAV Flight at Kandahar Airfield. The wing officially stood down on 18 August 2011. On 1 April 2015, the rank structure and insignia changed. The rank of private was replaced with that of aviator. The previously used term "leading aircraftman" was considered not to be gender neutral. Insignia were also changed from golden yellow to a pearl-grey colour similar to that worn before unification of Canada's Armed Forces in 1968. A revival of the former rank titles of the RCAF did not occur, however, as the former rank titles were considered "too confusing". Instead, the current rank titles were retained (with the exception of aviator). The Royal Flying Corps, considered to be a predecessor of the RCAF, used rank titles similar to the existing rank titles of the RCAF. On 9 November 1984, Canada Post issued "Air Force" as part of the Canadian Forces series. The stamps were designed by Ralph Tibbles, based on an illustration by William Southern. The 32¢ stamps are perforated 12 x 12.5 and were printed by Ashton-Potter Limited. Roundels used from 1920 until 1945 were usually the same as Royal Air Force roundels although not all variations were used and colours were matched to locally available paints. ^ a b "Purpose – General Information." Archived 2008-01-17 at Archive.today National Defence, 23 April 2008. Retrieved: 2 September 2009. ^ "Sic Itur ad Astra – Traditions Motto/Words." Archived 2013-05-22 at the Wayback Machine National Defence, 23 April 2009, Retrieved: 1 April 2013. ^ Royal Canadian Air Force. "Royal Canadian Air Force - Mission". Her Majesty the Queen in Right of Canada as represented by the Minister of National Defence. Archived from the original on 6 March 2016. Retrieved 19 March 2016. ^ Berthiaume, Lee. "Air force's new name got lost in translation, documents show." Archived 2013-10-17 at the Wayback Machine Postmedia News, 29 November 2011. ^ "Royal Canadian Air Force command changes hands - Skies Mag". Skies Mag. Archived from the original on 2018-05-05. Retrieved 2018-05-04. ^ "Canadian Forces name." Archived 2011-09-17 at the Wayback Machine CBC. Retrieved: 26 September 2011. ^ Associated Press, "R.C.A.F. Founder Taken By Death", The Spokesman-Review, Spokane, Washington, Monday 3 January 1944, Volume 64, Number 134, page 2. ^ Galloway, Gloria. "Conservatives to restore ‘royal’ monikers for navy, air force." Archived 2017-02-04 at the Wayback Machine The Globe and Mail, 15 August 2011. Retrieved: 26 September 2011. ^ Fitzpatrick, Meagan. "Peter MacKay hails 'royal' renaming of military." Archived 2011-09-24 at the Wayback Machine CBC News, 16 August 2011. Retrieved: 26 September 2011. ^ "Canada sending frigate to join NATO in eastern Europe|." Archived 2016-03-11 at the Wayback Machine The Globe and Mail, 1 May 2014. ^ Forces, Government of Canada,National Defence and the Canadian Armed (30 March 2015). 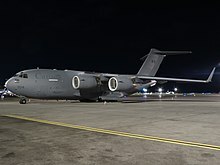 "Canada News Centre - Archived - Government of Canada Welcomes Increased Air Power for the Royal Canadian Air Force - Canada's Fifth CC-177 Globemaster touches down at 8 Wing Trenton". Archived from the original on 1 April 2015. Retrieved 5 April 2015. ^ a b c d e f "World Air Forces 2018". Flightglobal.com. Archived from the original on 2018-02-06. Retrieved 2018-09-04. ^ Warwick, Graham. "Canada signs $1.4bn contract for 17 Lockheed Martin C-130Js." Archived 2008-03-10 at the Wayback Machine Flight International, 16 January 2008. Retrieved: 17 January 2008. ^ "Canadian Forces CC-130 Hercules." Archived 2011-07-06 at the Wayback Machine Ody.ca . Retrieved: 20 March 2011. ^ "CF-18 Hornet in Canadian Service." Archived 2013-09-28 at the Wayback Machine ejection-history.org.uk. Retrieved: 26 September 2011. ^ "Canadian CF-18 fighter jets to be kept in use until 2025." Archived 2014-10-04 at the Wayback Machine airrecognition.com, 2 October 2014. ^ "Dillon Aero 7.62 mm M134 Minigun during exercise near Kandahar." Archived 2011-06-09 at the Wayback Machine The Maple Leaf, Vol. 12, No. 9, 4 March 2009. Retrieved: 26 September 2011. ^ "Griffon at Kandahar. "[permanent dead link] airforce.forces.gc.ca. Retrieved: 26 September 2011. ^ First CH-147F Chinook helicopter welcomed to Canada Archived 2013-06-28 at the Wayback Machine, National Defence- Royal Canadian Air Force Retrieved: 28 June 2013. ^ "Boeing Completes Delivery of Canadian CH-147F Chinooks Transport Helicopter." Archived 2014-07-14 at the Wayback Machine Global News, 2 July 2014. ^ "Boeing delivered CH-147F Chinook Maintenance Trainer to the Royal Canadian Air Force." Archived 2015-01-14 at the Wayback Machine Global News, 13 January 2015. ^ "Tactical combat training provided to the armed forces of Canada, France and the United States." Archived 2011-02-07 at the Wayback Machine Lortie Aviation. Retrieved: 26 September 2011. ^ "CF-188 Hornets on Op MOBILE drop first JDAM bombs." Archived 2012-03-08 at the Wayback Machine Forces.gc. Retrieved: 2 February 2012. ^ "Disposal of Rockeye Cluster Bombs at CFAD Dundurn." National Defence and the Canadian Forces, 27 July 2004. Retrieved: 26 September 2011. ^ "Cold Lake Air Weapons Range." National Defence Canada: 4 Wing Cold Lake . Retrieved: 26 September 2011. ^ "Goose Bay The Freedom to Fly." Archived 2012-12-01 at the Wayback Machine National Defence Canada: 5 Wing Goose Bay . Retrieved: 16 May 2012. ^ "New Commander for 2 Canadian Air Division." Archived 2017-01-04 at the Wayback Machine Department of National Defence, 6 November 2013. ^ "Pictou County man new commander of Air Division, Winnipeg." Archived 2012-03-29 at the Wayback Machine The News, 13 July 2011. Retrieved: 26 September 2011. ^ "Overview." Archived 2009-09-19 at the Wayback Machine Rocky Mountain Rangers. Retrieved: 26 September 2011. ^ "Canadian Forces Base Edmonton – Canadian Army." Archived 2014-10-15 at the Wayback Machine forces.gc.ca. Retrieved: 11 April 2015. ^ a b "New Royal Canadian Air Force uniform unveiled." Archived 2014-09-24 at the Wayback Machine CTV Ottawa1 April 2015. ^ a b c "DND Backgrounder." Archived 2014-12-18 at the Wayback Machine news.gc.ca, April 2015. ^ "Canada Post stamp." Collections Canada. Retrieved: 23 October 2012. ^ "Royal Canadian Air Force". Public Register of Arms, Flags and Banners. Governor General of Canada. Archived from the original on 21 September 2017. Retrieved 4 September 2017. Douglas, W. A. B. The Creation of a National Air Force: Official History of the Royal Canadian Air Force, v. 2. Toronto: University of Toronto Press (in co-operation with the Department of National Defence), 1986. ISBN 0-8020-2584-6. Milberry, Larry, ed. Sixty Years: The RCAF and CF Air Command 1924–1984. Toronto: Canav Books, 1984. ISBN 0-9690703-4-9. Piggott, Peter. Flying Canucks: Famous Canadian Aviators. Toronto: Hounslow Press, 1996. ISBN 0-88882-175-1. Piggott, Peter. Flying Canucks II: Pioneers of Canadian Aviation. Toronto: Hounslow Press, 1997. ISBN 0-88882-193-X. Wikimedia Commons has media related to Royal Canadian Air Force. This page was last edited on 18 April 2019, at 13:15 (UTC).